At Child’s View we follow the philosophy of Maria Montessori, who developed a method of education that works in harmony with the child’s natural development through the use of specialized environments. Dr. Montessori found that children’s best learning takes place through their senses and through their physical activity within their environment. She noticed that the young child’s mind is like a sponge, soaking up all aspects of the environment. She called this the “absorbent mind.” Montessori also discovered that the child’s learning is further enhanced through “sensitive periods,” in which the child shows an intense interest in a particular skill or aspect of their development. During such a period, children develop an increased desire and ability to learn and develop along the lines of that sensitivity, making the experience easy and enjoyable. Maria Montessori believed that within each child lies a great potential waiting to be released. She considered the work of the child to be that of creating the adult s/he will one day become. Through the Montessori method, children have been able to attain a higher level of development than previously thought possible, not only academically, but in all areas of their growth and development. In a Montessori classroom, care and respect for each other and for the environment are stressed at all times. Each child is provided the freedom to move about the classroom, choose activities appropriate to their ability, explore all the constructive possibilities of their chosen “work,” and socialize with other children. Through their “work,” children develop a sense of serenity, joyfulness and an inner discipline. Children in a Montessori environment are aided in developing independence and a positive self-image. They are guided in gaining increased learning skills and in maintaining their natural love of learning. Most importantly, each child is fully respected and honored for the gifts they are already contributing to society. 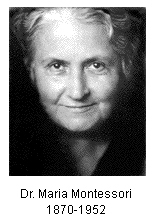 Dr. Montessori returned to her studies, devoting her life to this goal. In 1907, in a slum in San Lorenzo, Italy, the first “Children’s House,” Casa dei Bambini, began. As reports of Dr. Montessori’s exceptional children spread, people came from all over the world to see for themselves. Dr. Montessori continued to further her observations and began training teachers in her methods. Montessori classrooms began springing up all over the world, and with the same “surprising” results as in San Lorenzo. From her careful observations and studies, Dr. Montessori developed a method of education that caused her to be honored and respected throughout the world. In addition, she was instrumental in changing the conditions and treatment of children, and has had a tremendous impact on the course of education as a whole. Her ideas have gone beyond the Montessori classroom and are seen in all areas and methods of education. Today, Montessori is the largest pedagogy in the world.